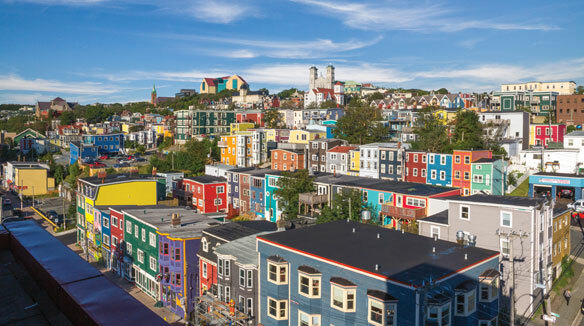 (This week, Travel Courier’s Cover Story offers readers something a little different as TC’s Ashley Rochefort provides a first-hand report on what she did on her summer vacation to beautiful St. John’s, Newfoundland … so read on… and enjoy)[Ed.]. Deciding on St. John’s for my family summer getaway was easy. The city’s multi-generational appeal is its perfect combination of sights, natural beauty, shopping, world-class dining, and charming character. Perched over the Atlantic Ocean, atop a ragged and rocky terrain, lies North America’s oldest and most easterly city. St. John’s is surprisingly sprawling. With a population of just over 205,000 spread over 446 square kilometres (comparatively, Toronto has three million people in 630 square kilometres), it feels more like a small town than the province’s largest metropolis. Even in the height of summer, it’s impossible to escape the winds of the North Atlantic, and carrying a light jacket is always recommended. Set on a steep hill, St. John’s downtown core is small in size, but big in personality. Spread over just a few main streets makes it easy to navigate the many galleries, stores, restaurants, bars, and souvenir shops. There’s a photo-op on every corner; side streets are stacked with the famous jelly-bean coloured rowhouses, Signal Hill’s Cabot Tower looms in the background, and St. John’s Harbour, a working harbour inaccessible to the general public, is beautiful in its own bustling way. But it’s the people of St John’s who bring the city to life. They’ve got a friendly ease, a worry-free demeanour, a twinkle in their eye, and a song in their voice that will make you feel instantly at home. It took only a weekend for St. John’s to steal my heart, but a weekend sure does go by quick. Here are some bona fide restaurant and attraction recommendations from my itinerary that your clients will thank you for. By 2 p.m., we’ve arrived, grabbed our rental car, and checked into our hotel. Though we have an agenda for our first day, we can’t help but abandon it to stroll downtown, taking in the harbour views, imagining what’s inside the colourful rowhouses, and popping into cute shops and cafés. From downtown, Cabot Tower at the top of Signal Hill, built in 1897 commemorating the 400th anniversary of Newfoundland’s discovery and the site of the first transatlantic transmission in 1901, is a relatively easy 20-minute up-hill walk. Offering incredible city and ocean views, there are a variety of longer trails available for eager hikers. Before heading back to the hotel to freshen up for dinner, we take a few moments to pay respects at the Terry Fox monument, where a 21-year-old Terry embarked on the Marathon of Hope after dipping his artificial toes in the Atlantic ocean. For dinner, a fellow traveller recommends The Merchant Tavern. The tall-ceilinged, wood-panelled industrial dining room has a sophistication and warmth. From the menu, we try the Deluxe Seafood Plateau, a meal for two or starter for four-six, it’s a three-tiered seafood tower of fresh, in-season catch. 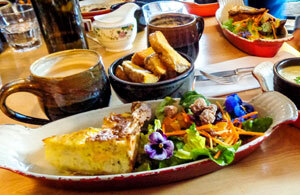 Indulge in brunch at Mallard Cottage with fresh seafood quiche and potato wedges. Today starts with the best brunch at the best restaurant on the east cost, Mallard Cottage. Featuring mostly savoury plates, we choose the seafood quiche with dreamy, salty, crispy potato wedges and finish at the dessert table filled with cakes and breakfast pastries. Make reservations several weeks in advance… seriously. Blessed with sunny skies and warm weather, we’re spending the day at sea aboard O’Brien’s Boat Tours. On the two-hour adventure led by lively, informative guides, we track humpback whales returning in summer months to feed, learn about the half-million strong Atlantic Puffin colony of Witless Bay Ecological Reserve, and bear witness to the haunting grandeur of passing icebergs. And what better way to finish our tour than being screeched-in on the open ocean, dressed in a yellow slicker hat, in front of a hundred of our newest friends. On the drive back to the city, we stop for dinner at the legendary Mary Brown’s for take-out of fried chicken, taters, and poutine with stuffing. There’s something awe-inspiring about seeing the sun rise before anyone else in North America at Cape Spear, the continent’s easternmost point. A quick coffee and pastry at local favourite, Rocket Bakery, is the fuel we need for a morning of shopping downtown. A few of our favourite stores included HOME, a beautifully curated home decor shop, Le Boudoir Lingerie, featuring high-end swimwear and helpful sales staff, and the Newfoundland Chocolate Company with local chocolate bars dressed in jellybean rowhouse wrappers. 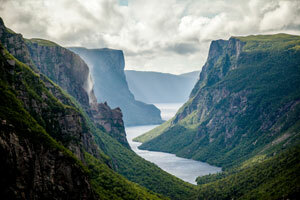 Breathtaking fjords at Gros Morne National Park. Photo courtesy Newfoundland and Labrador Tourism. That afternoon, lunch is at Piatto Pizzeria, an east coast restaurant chain doing Neapolitan pizza right. The Stephanie is a stand-out with a combination of goat cheese, prosciutto, caramelized pears, and balsamic glaze. Get the pizza and soup or salad lunch special for only $14. We walk off our lunch at The Rooms, a public cultural space, exploring the history, art and traditions of Newfoundlanders. It’s our last evening in St. John’s, so we head out to historic George Street for live fiddle music. On a Sunday night, the pedestrian-only street lined with bars is still lively, but not overcrowded. A quick bite to eat and we’re heading out of town. Thanks, St. John’s – I’m already planning my next visit! More than 500,000 people visit Newfoundland and Labrador each year, and that number is only increasing. Of those, nearly 87% are Canadians and 45% are over the age of 55. Though many travellers decide to go it alone, there is still ample opportunity for agents to make commissions. Help your clients book flights via WestJet, Air Canada, Porter and Sunwing, offering seasonal summer service at a great rate. Clients on their own will also require a rental car to get to sights around the city like Cape Spear and Witless Bay. Booking a hotel downtown can range from the economical Quality Hotel to the higher-end Courtyard by Marriott or Sheraton Hotel, all three options are within a stone’s throw of downtown. For senior clients, recommend one of the many coach tours operating in the province like McCarthy’s Party, DeNure Tours, or Senior Discovery Tours. Bus tours are very popular as they take the worry out of driving long distances, on sometimes treacherous highways, between sights around the province. High season in St. John’s and Newfoundland is July/August when the weather is slightly more predictable. However, the upcoming September through December season is rapidly becoming more popular, contributing about 30% to the total annual visitor numbers. In these late fall months, travellers can look forward to nature on a grand scale with wildlife viewing opportunities, amazing coastal hiking experiences, and epic fall vistas. For a full list of tour companies, things to do, places to stay, and ideas for your client’s next trip, visit www.newfoundlandlabrador.com . From hiking to kayaking to boat tours, from majestic fjords to desert-like tablelands to the summit of Gros Morne Mountain itself, Gros Morne National Park, the province’s second largest, has something for every outdoorsman, avid or amateur. Dating back more than 1,000 years, L’Anse Aux Meadows, a UNESCO World Heritage Site, is the site of North America’s first confirmed Norse settlement. Go on a guided tour of the reconstructed camp and learn about the Viking’s way of life. A contemporary structure in a rugged landscape with traditional sensibilities, Fogo Island Inn is the heartbeat of Newfoundland’s largest out island. Suites start at $1,675 per night. If that’s not in the budget, visit the inn and stay for a meal, reservations strongly recommended. Celebrate Canada’s 150th anniversary at the foot of historic Signal Hill.